After an earthquake erupts in Chile, tourist discover that a neighboring prison in the area collapsed in the event, and all surviving criminals managed to break free. Soon they learn that the most terrifying thing, more threatening that Mother Nature, is what she created. Taglines: The only thing more terrifying than Mother Nature is human nature. Ahhhh Chile. The women, the night life, the gorgeous greenery of the terrain. Chile is beautiful country. That is partly why American Gringo (Eli Roth) and pals Ariel (Ariel Levy) and Pollo (Nicolas Martinez) love it so much. Their adventures in Chile would be the envy of any man. And when the trio hook up with three smoking hot women, Kylie, Irina and Monica (Lorenza Izzo, Natasha Yarovenko and Andrea Osvart, respectively), the whole potential adventure fun meter goes off the chart. The six friends find themselves having such a good time that they agree to all travel together to the coastal town of Valparaiso. As the night becomes early morning, the group find themselves enjoying the dance clubs the city has to offer. But their night of reckless unabandon turns into terror when an 8.8 magnitude earthquake hits the city turning their paradise into a mound of death and ruins where our protagonists must survive everything from looters, escaped convicts and the constant aftershocks in the earthquake's wake. 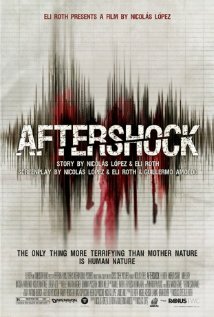 Aftershock is written and directed by Nicolás López (Eli Roth takes a co-writing credit) who uses true stories of the real 8.8 magnitude earthquake that hit Chile in 2010 as the basis for his survival film. Shot in Chile, many of the scenes were set in areas that still remain in ruin after the powerful disaster. This gives an authentic and realism feel to a film that is as hard to believe as it would be as plausible to accept. The first half of the film is a disaster movie true and true. We spend a good time getting to know our characters and I would suggest that knowing Eli Roth was involved will give audiences the patience in knowing that the set up is worth the pay off. When the earthquake hits, the chaos begins and bodies (and their parts) are thrown around screen in wild grotesqueness. As the six main characters attempt to escape onto the street, the devastation engulfs them. But they must quickly gather themselves in fear of a tsunami warning that is ringing throughout the city. Running, screaming and reacting to the city in ruins takes us to past the half way mark of Aftershock. But then director López switches gears and Aftershock becomes a horror movie with evil characters and murders rampaging through the streets in search of women and blood. The script penned by López and Roth continues to surprise throughout. Every death comes as a shock and how they pass is even more shocking. Don't bother guessing who will survive as the script has no 'untouchables' and everyone is fair game. Eli Roth accepts his first top billing role and plays the nerd, gringo perfectly. Bloodsoaked and searching for safe haven, he is the personality that propels the first quarter of the film only to pass off his full frame attention to actor Nicolás Martínez and the rest of the surviving team. There are plenty of Roth-isms to be found in Aftershock. The violence and gore is violent and gory. People are impaled, burned, shot and murdered with axes. And the final scene was something that we are sure Eli had his hands all over relishing in the idea of closure. Aftershock was a crowd favorite at the Toronto International Film Festival Midnight Madness showing and it is easy to see why. Fans get a bit of everything  parts disaster movie, parts horror, parts thriller, parts titillating comedy. We enjoyed ourselves immensely in the adventure. We were involved enough with our characters that didn't care that it switched focus (and genre's) halfway through. We are just glad that we survived the screening and we can't wait to watch it again. A result of the word-of-mouth at the festival got Aftershock a distribution deal with Dimension Films. No release date has been set, but you can expect to see Aftershock hit theatres before long.